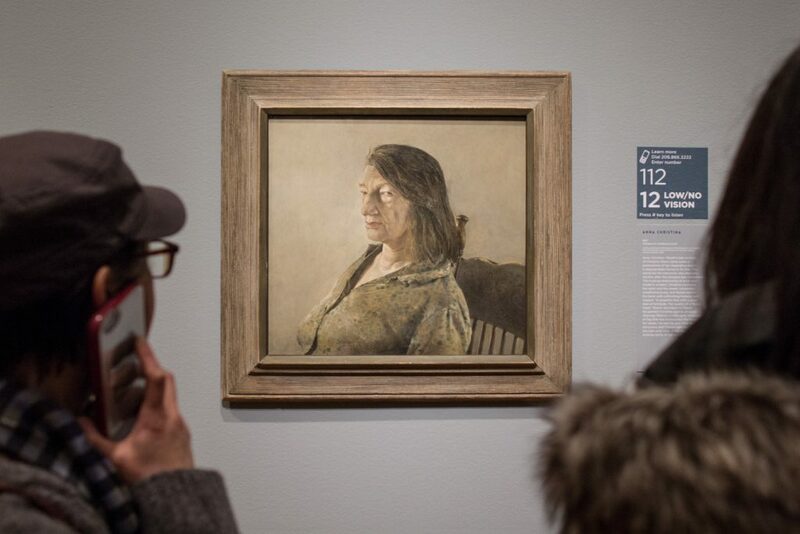 Andrew Wyeth met Christina Olson through his wife Betsy and first painted her in 1947. He would paint Christina every summer in Cushing, Maine for the next 20 years until her death in January, 1968. As Betsy explains it, “The key to the Olson pictures is Andy’s relationship with Christina—absolutely at ease with him.” Christina Olson, a New-England native, refused a wheelchair for much of her life, despite being without the use of her legs. Rather, she used her upper body to pull herself through the fields and house where she lived and worked. Her tenacity and intelligence captivated Andrew Wyeth and their friendship blossomed easily. Even in death, Andrew continued to draw inspiration from Christina through her house and the objects that had defined her. Wyeth considered this painting of the two entrances to her home a double portrait of the siblings, Alvaro and Christina Olson. When first introduced to the Olson siblings, Andrew was initially taken with Alvaro and painted his portrait before he become focused on the indomitable Christina. Alvaro died on Christmas night, 1967, and Christina, without him, died only weeks later. 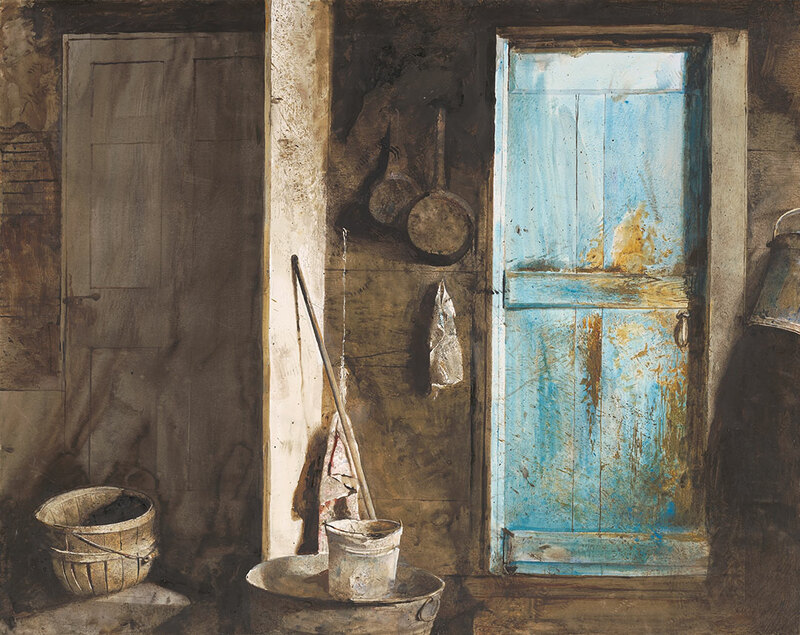 The house and remnants left abandoned in their wake struck Wyeth as symbolic of the lives they lived—the shadowy Alvaro, who only posed for Wyeth once and remained always in the background as Wyeth painted in the Olson house; and, by contrast, the brilliant, captivating Christina. Anna Christina is Wyeth’s last portrait of Christina Olson. She died only months after the tempera was completed. The trusting relationship of artist and model is evident: Christina confronts the artist and the viewer completely unselfconsciously, and Wyeth returns the favor with unflinching honesty and respect. “A powerful face with a great deal of fortitude. The Quality of a Medici head,” Wyeth described his friend. He painted Christina against an open doorway filled by a milky gray rectangle of fog that had enshrouded the house for weeks. Andrew Wyeth saw the world around him resounding with hidden meaning. 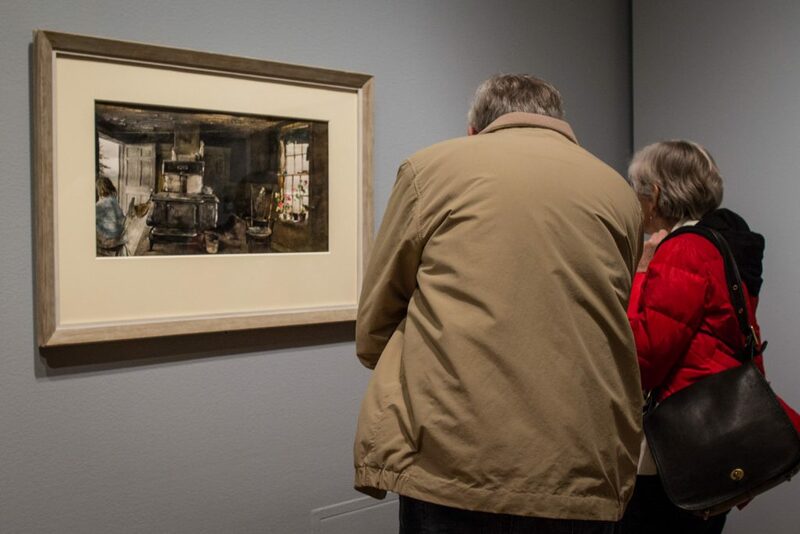 Occasionally considered a magical realist for his emphasis on the inner life of objects such as the stove or the bucket in this painting, Wyeth was certainly a storyteller. His paintings can be seen as stills in a moving image—the story of Christina’s Olson’s life surrounding her and continuing right outside the open door of her kitchen. Christina Olson was a muse for Andrew Wyeth that helped launch his career. As a subject she is forever seated due to the degenerative disease that made her a paraplegic, but in Wyeth’s paintings, the figure of Christina stands out, singular and strong in the stories of Wyeth’s characters. See Andrew Wyeth: In Retrospect before it closes, January 15. 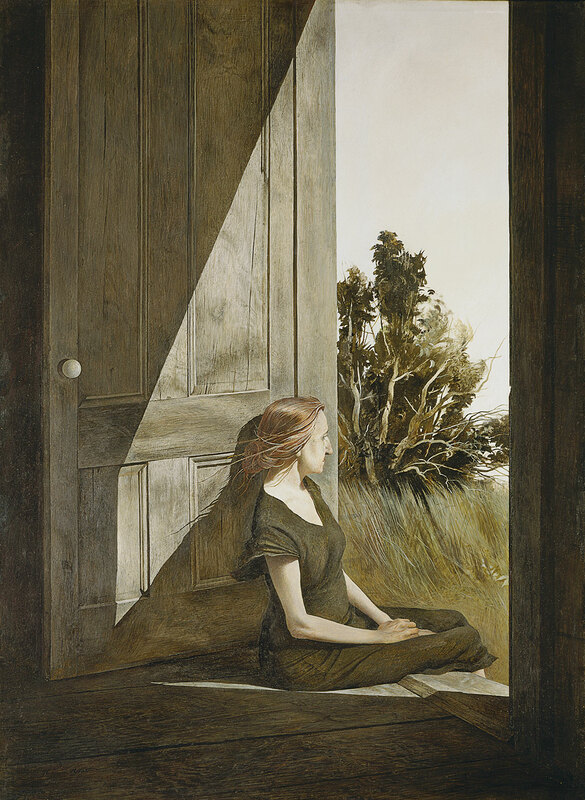 Images: Christina Olson, 1947, Andrew Wyeth, American, 1917–2009, tempera on hardboard panel, 33 x 25 in., Myron Kunin Collection of American Art, Minneapolis, Minnesota, © 2017 Andrew Wyeth / Artist Rights Society (ARS). Alvaro and Christina, 1968, Andrew Wyeth, American, 1917–2009, watercolor on paper, 22 ½ x 28 ¾ in., Farnsworth Art Museum, Rockland, Maine, Museum Purchase, 1969, © 2017 Andrew Wyeth / Artist Rights Society. Installation views of Andrew Wyeth: In Retrospect at Seattle Art Museum, 2017. Photos by Natali Wiseman.